Unparalleled beam brightness at the National Synchrotron Light Source-II significantly increases the probability of a photon colliding with a gas atom at ambient pressures. The beamline makes it possible to use XPS to directly study the two most abundant elements in the universe. Also, this work helps describe the limits of XPS, opening a broader scope for one of the most useful techniques in materials science. X-ray photoelectron spectroscopy (XPS) is one of the most powerful techniques in materials science. However, the literature is filled with claims stating that it's impossible to use XPS to study the two lightest and most abundant elements in the universe, hydrogen and helium. 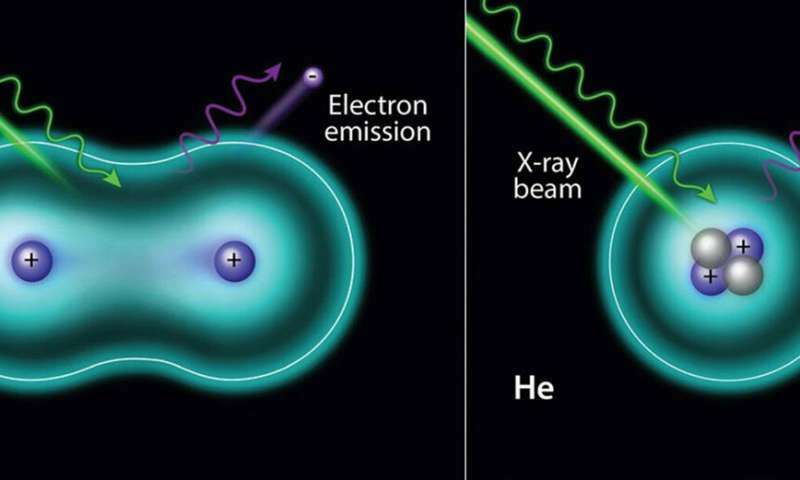 This work demonstrated that ambient pressure X-ray photoelectron spectra of hydrogen and helium can be obtained when a bright-enough X-ray source is used, such as at the National Synchrotron Light Source II. In the case of helium gas, the spectrum shows a symmetric peak from its only orbital. In the case of hydrogen gas molecules, an asymmetric peak is observed, which is related to the different possible vibrational modes of the final state. The hydrogen molecule vibrational structure is evident in the H2 1s spectrum.